Colossal Curl at Busch Gardens Tampa is, well…Colossal! It’s a very unique hybrid water slide that combines the best elements of several other slides into one massive experience that will be opening this Spring at Adventure Island. Recently we were able to walk the construction site for Colossal Curl and learn more about the huge new family slide coming to the park. 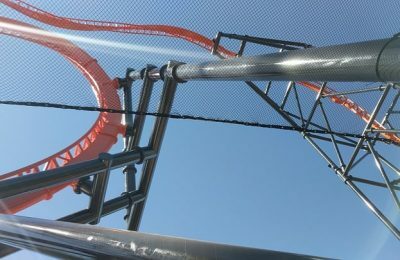 Colossal Curl is the first new attraction at Adventure Island in several years. It is also one of the largest attractions that has ever been built in the park. It’s about 70 feet tall, and will take over 114 steps to get to the top of the tower, so you’ll get your exercise to make the run to the bottom. · The thrill slide’s fiberglass sections were built in Canada by ProSlide Technology, Inc.
· More than 2.6 million pounds of concrete were poured to create the foundation for Colossal Curl. · More than 235,000 pounds of steel is used to support the thrill slide. · Colossal Curl weighs about 293,500 pounds. · There are 114 steps to reach the top of Colossal Curl’s tower. 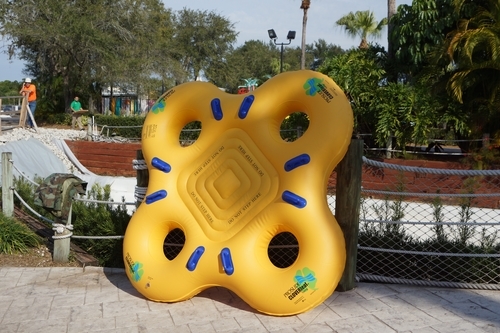 · Clover rafts make Colossal Curl perfect for families and friends to conquer together. · Guests must be at least 48 inches tall to ride Colossal Curl. · Colossal Curl’s ride path is approximately 622 feet long, taking riders about 40 seconds to conquer the Curl. 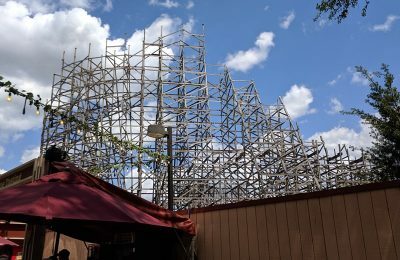 The construction process has been moving along very quickly, as construction began the day after the park closed for the season in the fall of 2014. The construction is no small undertaking, using 235,000 pounds of steel and over two million pounds of concrete. The ride is about 622 feet long, and all the fiberglass pieces were constructed in Canada by ProSlide Technology, and were shipped in several loads all the way to Tampa. As many may know, the ride was actually first built in Virginia at Water Country USA next to Busch Gardens Williamsburg. That ride was so popular with families and thrill seekers that Adventure Island knew it would be the perfect match for their park as well. The slide takes riders just 40 seconds.to conquer, which sounds extremely fast, but the park promises it’s going to be perfect for the entire family. 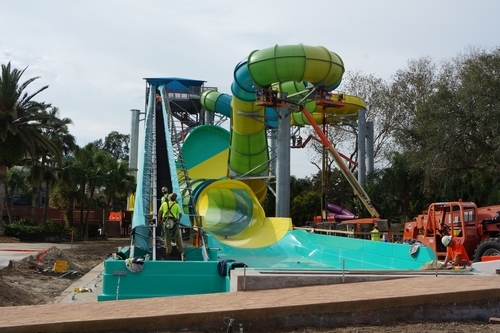 We caught up with the Vice President of Adventure Island to talk more about the new slide. 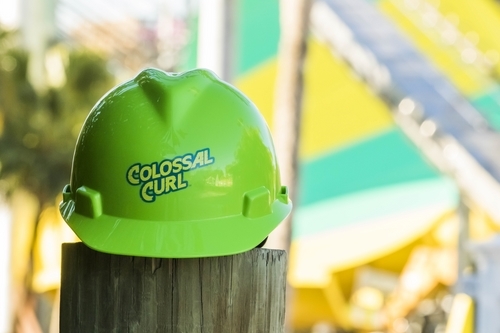 Video-We chat with Adventure Island Vice President about Colossal Curl! The clover shaped rafts will hold up to four as they take the plunge, and splash down into the hurricane tube before making the final run down the slide and up the wall into that massive curl. Riders only have to be 48 inches to ride. Currently there is no opening date for Colossal Curl, but the park will open on March 7th for the 2015 season. With the slide almost complete, it’s not outside the realm of possibility that the attraction could open with the park, but we’ll wait for an official opening date. 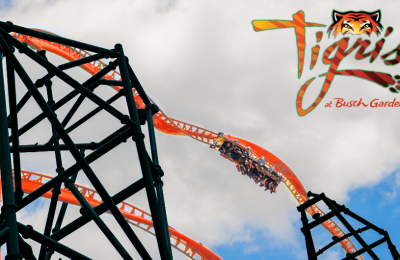 Stay tuned for more from Adventure Island, and be sure to get social with us on Facebook and follow along with us on Twitter @BehindThrills for the latest updates! For more information about Adventure Island, including tickets, visit the official website by clicking here! Special thanks to Mackey Updates for providing pictures and video for us! Previous PostDream vision Company reveals plans for Alabama park called Soundscape Next PostHorror falls in love with Valentine's Day as luck gets presidential at haunts this weekend!